The Shizhudi site is located in Tianba village, Loudong Town, Yibin City, Sichuan province. It is on the terraces from level 1 to level 5, north bank of the Jinsha River, which is within the submerged area by the Xiangjiaba Hydropower Station. In May, 2011, Sichuan Provincial institute of Archaeology and cultural relics organized a professional team to carry out a coring work and found cultural deposits dated to Neolithic, Shang and Zhou dynasties and a large number of tombs dated to Han dynasty. This site covers about 10 ha and could be divided into four sections. During June, 2010 to November, 2011, four times of archaeological excavations were carried out in the section I and III, and the total excavation area was about 1 ha. 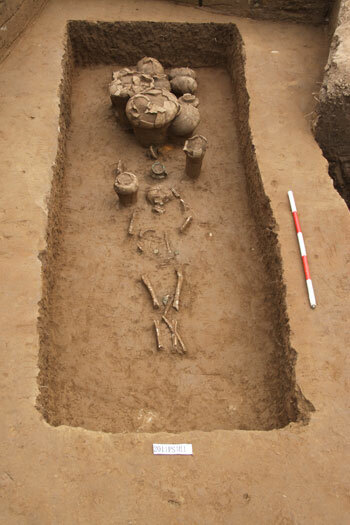 As a result, over 800 cultural remains in total were excavated dated respectively to Neolithic period, Shang, Zhou, Warring States, Qin, Han, Ming and Qing dynasties. While a large number of soil samples, charcoal samples, faunal and floral samples were collected, and many potteries, bronze, iron and lithic artifacts were unearthed. Section I: the deposit could be divided into 22 cultural layers. Among them, Layer 19-22 were dated to the Neolithic period; Layer 15-18 were dated to Shang and Zhou dynasties; Layer 11-14 were dated to Qin and Han dynasties; Layer 2-10 were dated to Ming and Qing dynasties. Section III: the deposit could be divided into 12 cultural layers. Layer 12 were dated to the Neolithic period; Layer 9-11 were sand layers; Layer 6-8 were dated to Shang and Zhou dynasties; Layer 4-5 were dated to Han dynasty and Layer 2-3 were dated to Ming and Qing dynasties. The remains dated to the Neolithic period include house remains and ash pits. House remains were almost square pile-dwelling style building. 2010PSF2 was 3 meters long and 2.2 meters wide, covering about 7 square meters. It consisted of 14 post holes, each of which was 12-18cm in diameter and 29-40cm in depth. In addition, the fill in the post holes was grey brown soil with half sand. The artefacts are mostly pottery and lithic tools. The majority of the pottery is made of sandy clay and the minority is of fine clay. The pottery is in yellow-brown, red-brown, black-brown, gray and so on in color. The patterns include cord mark, thin string mark, additional heap pattern, engraved lines etc. The identified artifacts include jars with wide folded-edge and lace rim and cord pattern, plate-rim ware, jars with wide flared mouth and folded-rim, lids of wares, ringed-foot wares, net pendant, etc. The lithic tools include ground stone tools and chipped stone tools, but the ground stone tools are the majority. And the categories of the stone tools are ground stone adzes, stone axe, stone pestles, stone balls, choppers and scrapers, etc. There are over 250 remains dated to Shang and Zhou dynasties, including ash pits, house ruins, tombs and ash ditches, etc. Moreover, there were 20 house ruins discovered and all of them were above ground buildings. These buildings could be divided into two categories based on their styles: one with foundation trench and post holes, the other round or square buildings without foundation trench but composed of post holes, such as 2011PSF12, which was composed of eight post holes and oval shape in plane with a 3m maximum diameter and a 2m minimum diameter. Only two tombs dated to Shang and Zhou dynasties, both of which were pit tombs. The skeletons were not preserved well. In addition, there were not many grave goods in the tombs. The identified artifacts include pointed bottom jars, pointed bottom cups, pointed bottom small cups and flat bottom jars with wide flared mouth, etc. The cultural relics are mostly pottery and stone tools. The pottery is mainly sandy clay pottery with some fine clay pottery, and mostly gray-brown and red in color. They were not decorated or decorated with cords patterns, and a few others, such as string patterns, additional heap patterns and lozenge patterns. The identified artifacts include pointed bottom jars, pointed bottom cups, round bottom bowls, pointed bottom small cups, small flat bottom jars, high neck wares, ringed foot wares, dou plates, net pedants, spinning wheels, etc. The majority of the stone tools are mostly ground stone tools, including axes, awls, adzes and rings, etc. The minority of the stone tools are chipped stone tools, including double-shouldered axes and choppers, etc. By preliminary analysis, the sharp bottom cups and small flat bottom jars are dated to the Shang and Zhou dynasties, but the similar artifacts from the Shierqiao Culture in Chengdu Plain were dated to the West Zhou dynasty. Over 250 remains were excavated, including tombs, ash pits, ash ditches and house ruins etc. Most of them are tombs which were over 140 and became one of the most important cemeteries in the South of Sichuan Province. The tombs are varied in category and distributed regularly. The category includes square pit tombs, round pit tombs, brick chamber tombs, stone chamber tombs, urn-coffin tombs and so on, but the majority is pit tomb. The grave goods are numerous and have their characters, including pottery, bronze, iron, silver, stone, metal beads and others. The pottery is mostly sandy clay pottery and gray, gray-brown, black-brown, red, yellow-brown in color. The identified artifacts include caldrons, steamers, cooking pots with one handle, basins, round bottom jars, flat bottom jars, flat bottom jars with small mouth, jars with two handles, lids, bowls, ceramic houses model, field models, ceramic tables, chickens, dogs, servants holding shield and servants, etc. The bronze artifacts include swords, spears, mirrors, coins and others. The iron artifacts include swords, axes and forks. Almost 250 remains were unclosed, dating to the Ming and Qing dynasties, including house ruins, ash pits, ash ditches and tombs etc. The tombs are square pit tombs or stone chamber tomb, but the tombs were heavily destroyed and only two of them were preserved well. The ash pits are oval, round and irregular with a great quantity grave goods including pottery, iron artifacts, bronzes, stone tools and numerous porcelains. Most of the porcelains are blue and white, celadon and glaze in color. The identified artifacts include plates, small cups, bottles, cups and jars, etc. In addition, there is a street ruins discovered. It was paved with blocks and only about 100 meter long and 1.5-3 meters wide were remained, dating to the end of Ming dynasty.